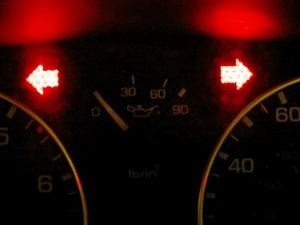 I cannot afford a brand new car, so could someone please tell me, do the new models not come equipped with turn signals? I am forever amazed at people who do not use them. It's the simplest concept that nonverbally communicates your intentions to other drivers. The turn signal is quite amazing. Did you know that it was a woman who invented it? True story. 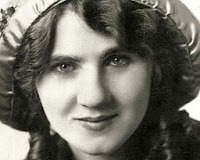 Florence Lawrence, a silent-film star in the early 1900's, came up with the idea in 1914. It originally was a "signaling arm," that when a button was pressed inside of the car, would raise a flag on the rear bumper to notify another driver which way the car was going to turn. She also fashioned a brake signal. It was a little sign that said, "STOP," which flipped up from the rear bumper when the brake was applied. But I digress. This morning, as I was trekking my way into work, I had a vehicle come to an abrupt stop in the middle of the road. It was pitch black dark, so from my vantage point behind him, I could not tell if some little varmint had dashed out into the road in front of them or what was going on for them to hit the brakes. As it turned out, they were turning, without a turn signal. I couldn't be certain in the dark, but I'm fairly sure it was a man driving. I say this, because so often it's women who get the bad reputation of not driving well. Yes, I keep a score card. Regardless, I'm urging all drivers to USE YOUR TURN SIGNALS, it's particularly important in winter driving, when stopping and slowing can trigger a scene akin to billiard balls bouncing off of one another. Seriously, there is no excuse for not using your turn signals. If you're yakking on the cellphone with one hand and can't be bothered to flip the lever, because you only have two hands, then you are an even worse driver, who deserves to be shamed mercilessly in front of everyone. 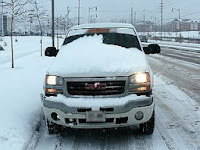 And while we're on the subject, consider brushing the snow off of your headlights, taillights and other pertinent equipment on your vehicle this winter season for your own safety. It should go without saying that if you drive without clearing your windows you deserve to have your license revoked. You are a danger to everyone and most importantly, incredibly stupid. What are your pet peeves when it comes to driving? Drop us an email. I Don't Think This Was Original Equipment! So Is It Bluetooth, Or Blueteeth?